His given name was John, no middle name, just like his father. And just like his father, everyone called him Jack. Dad was a Baptist Minister. 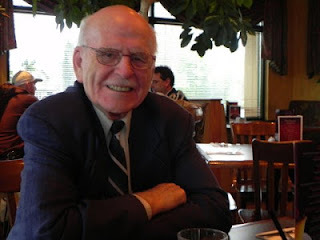 Reverend Jack Farr died on January 14th, 2013 at about 8:45 in the morning. He had been in palliative care at the Nanaimo General Hospital for only a couple of days. It was pancreatic cancer, diagnosed just a few weeks before. Doctors had told him there was nothing they could do but make him as comfortable as they could. He lost a lot of weight as he wasn't able to stomach much in the way of food. The good news is he did not have the pain often associated with that kind of cancer. Dad's passing was peaceful. He was watching the hilites of the NFL playoff game between Seattle Seahawks and Atlanta Falcons. My brother and youngest sister were with him. His breathing changed and he quietly slipped away. Dad was 88. There are many significant dates in his life beginning with his birthday, July 12, 1924. His family lived in Brantford Ontario, where Alexander Graham Bell invented the telephone, a city now more famous for Wayne Gretzky. December 31, 1942 was the first date with Mom. It was New Year`s Eve. They went ice skating and to a movie. Somewhere along the way, Dad stole his first kiss. That was the beginning of a relationship that can only be described with words like loving, dedicated and spiritual. On December 31st, 2012, they celebrated the 70th anniversary of that first date and Dad was still stealing kisses. In April of 1943, he enlisted in the RCAF. His mother pinned his wings on his uniform at flying school in the prairies. That was May of 1944. Dad loved the air force. He loved flying planes of all sizes. He loved the discipline of service in the military including the spit and polish. I never knew Dad to have scuffed shoes. He would buy air force issue black shoes, the ones with the toe caps, whenever he could and they were always ready for inspection. He was a little taller when wearing his uniform. He was proud of his service to our country during the Second World War, and proud of his medals, especially the Burma Star for service in the Burma Theater. 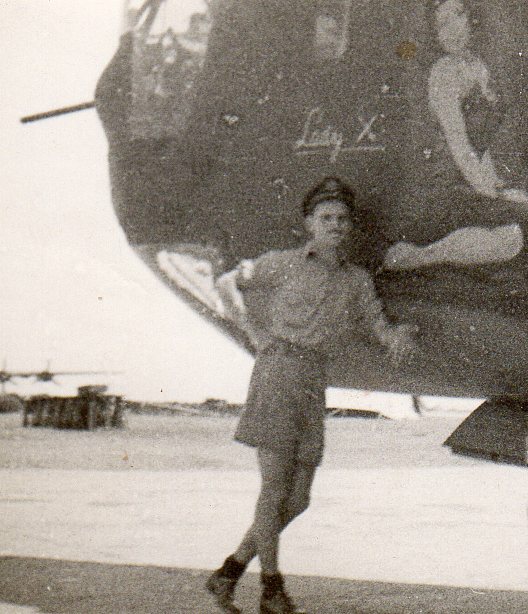 He was a co-pilot on a B24 Liberator. It was an RAF aircraft flown at various times by crews from Britain, Australia and Canada. Burma was a joint operation. The Liberator was called Lady X. With Dad on board she was shot up but never shot down. One of my favourite war stories of his is this. Our father bombed the bridge over the River Kwai. Yes, that bridge. The one made famous in the movie by the same name. His crew missed. The bridge was taken out by the next Liberator in the formation. As Dad would tell the story, the real thing was nothing like the movie. When he got back home after one and a half tours of duty, Dad finally won the day with our mother and they were married on October 18, 1946. A year and a bit later, on February 4, 1948 I was born in Brantford. Dad was an insurance agent for six years after getting his grade 13 through the armed forces post war program. He had a house built for us and he was instrumental in the construction of a new church. Mom and Dad had five children. All except for me were born about the same time as a major family move. 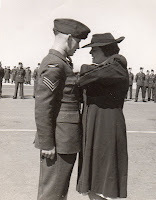 Dad reenlisted in the RCAF in 1952 because of the Korean conflict. He was posted to Summerside PEI. Frances was born on November 13. He was transferred to the air base in Trenton Ontario and Doug was born on December 20, 1954. He was transferred to the air base in Centralia, just north of London Ontario. Shirley was born in nearby Exeter on December 26 1956. He accepted his first church in Mt. Brydges Ontario, southwest of London and Cathy was born on October 30, 1958 at a hospital in London. I was convinced for years that babies were delivered in moving vans. Dad felt the call to the ministry while still a flying instructor in the RCAF. When discharged, he accepted his first church, actually two churches, one in Mt. Brydges, a town of 758 people and the other out in the country in the middle of the farmers’ fields. Dad was a leader. In a new church he would always ask, where to you want to go and then he would lead the congregation to that destination. He learned quickly that he didn’t have all the answers and that he couldn’t do everything himself. But he was as adept at recognizing a good idea and making it possible as he was in believing in the good in people and helping them achieve their potential. One thing is certain. He was instrumental in the growth of every church he pastored. After Mt. Brydges, our family was off to Toronto. Dufferin Street Baptist Church was in what was a growing community of immigrants, especially from Italy. Dad recognized the need for English classes and with the help and support of the congregation, an outreach program was born. You have to understand how deeply rooted he was in the RCAF. His dream was to return to full time duty, not as a flying instructor but as a chaplain. For years, our summers were spent on air force bases. Dad was in the reserve and filled in for protestant chaplains taking time with their own families. Our vacations were adventures in a travel trailer pulled by a station wagon. We had several over the years. RCAF openings for protestant chaplains were rare. Dad waited for one to come up. God clearly had another plan. The day he accepted the call to Grandview Baptist church in Vancouver was the same day the mailman delivered the RCAF letter offering the chaplaincy he had wanted. Vancouver happened in the morning, the mail came in the afternoon. Dad always saw it as divine intervention. September 1969. After taking university courses since the late 40`s, Dad earned his Bachelor of Arts Degree from McMaster University. For us it was another example of Dad`s ability to envision a result and do what was necessary to achieve it. He was also a builder. He could see the outcomes long before most other people. He could describe the benefits and could find the ways to get it done, whether it was new church construction or old age homes, church investments in facilities such as camps for retreats and summer experiences or nearby homes for outreach programs. He even made it possible for one of his churches to buy an abandoned town. Also in September 1969, he became Pastor of Crescent Heights Baptist Church in Calgary. July 1975 it was off to Winnipeg where he became Area Minister for Manitoba and for a time, also Area Minister for Saskatchewan. August 1981, Director of Stewardship, Director of The Baptist Union of Western Canada Foundation and Director of Church Growth for the Baptist Union of Western Canada from their offices in Calgary. November 1988, Minister of Pastoral Care, First Baptist Church Vancouver. Somewhere in those years, he retired but in October of 1993, he accepted the challenge of being the interim pastor of Calvary Baptist Church in Chemainus BC. He and Mom moved to the Island and bought a home in Ladysmith. In March 1996, it was out of retirement again to be the interim Pastor at Community Baptist Church in Inuvik Northwest Territories. That was a 3 month commitment. And then out of retirement again for several months in Chemainus as well as Duncan and Victoria. My family has rarely been in the same place at the same time since I left home back in the 60's. We managed to all get to Dad's bedside though and the stories flowed. At one point we were laughing so loud that one of the nurses came and closed the door to his room. He was in and out of sleep yet still managed to crack a smile as we reminisced. He asked questions and participated as he could. The night before he died, we had decided that we would not leave him alone. Terrie and I took a break and then sat with him for several hours that evening. Dad loved hockey and football but especially hockey. One of my fondest memories was when I was 7 years old. He had built a large model train layout on a piece of 4 x 8 plywood. We had moved and we lost interest. Dad got talking to the owner of the town hardware store. The guy told him he wanted a train set for his window display over Christmas. Dad was a bit of a horse trader. He offered our train set and came home with a new TV, our first. It was a Saturday and Dad let me stay up past my bedtime to watch Hockey Night in Canada with him. It was the Leafs against the Red Wings. I was hooked. In the following years he got me started collecting hockey cards. After our son was born, my Dad gave me the hockey cards he had collected in the 1930's. I have mine from the 50's and early 60's and have the cards our son collected in the 80's. These cards form the basis of my sports memorabilia collection. It now fills a room. So here he is just hours from passing away. He wakes up, recognizes Terrie and me sitting by his side. He looks at me and says, "did they trade Luongo yet?" Dad led a rich and full life in the service of his God, his family, his church family and his country. Our parents were together through 66 years of marriage. Five children gave them five grandchildren and one great grandchild. Dad, you will always have our love, respect and admiration.